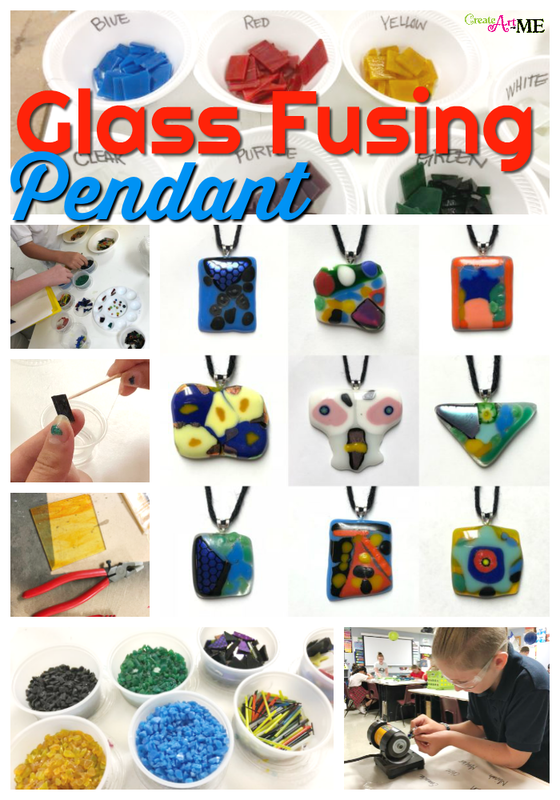 Glass fusing pendant art lesson for middle school and high school art classes. Yes-you can fuse small glass projects in a kiln! 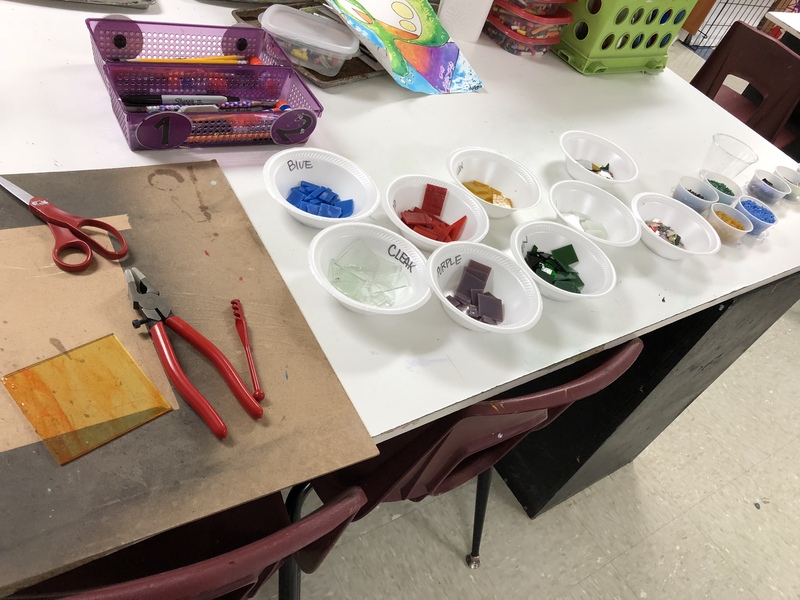 • Students will learn about the medium of glass fusing. 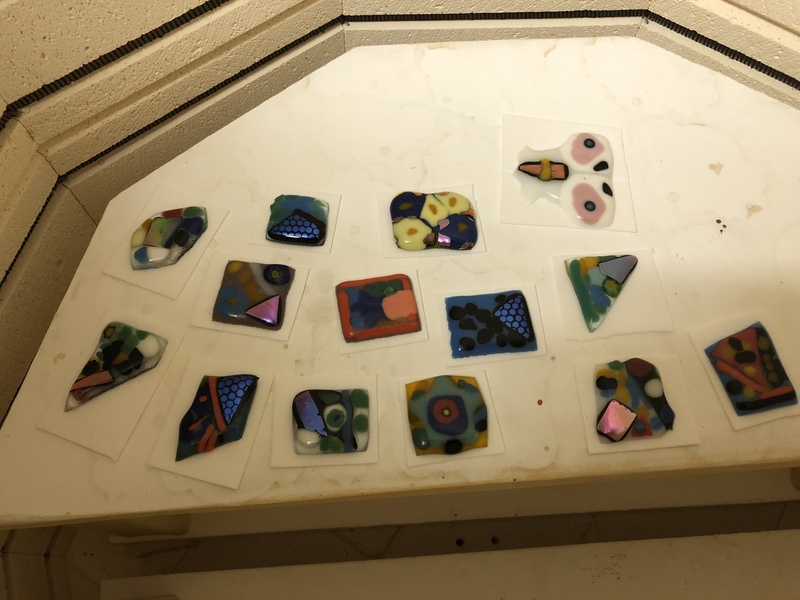 • Students will learn basic vocabulary and techniques of glass fusing. • Students will demonstrate proper use of tools and exemplify understanding of safety working with glass. Glass fusing and slumping are often referred to as warm glass, or glass art fusion. Glass fusing is the process of using a kiln to join together pieces of glass. Heat softens glass and the higher the heat the more fluid or molten it will get. When the right kind of glass is heated and then cooled properly, the resulting fused glass piece will be solid and unbroken. Tack Fusing: Fusing glass until it just sticks together. Each piece still retains its individual character. Full Fuse: Heating two or more pieces of glass until the slump and flow together to form one solid piece of glass. Art Glass: Colored glass used in glass fusing and stained glass. It may have certain properties required for fusing. Bails: Arched hoop-like pieces that are attached to glass pieces, allowing you to hang the glass piece on a chain or link it to another object. Confetti: Thin shard of glass used to add shading and design. Also referred to as shards. Shards: Glass that has been cut or broken from a sheet of glass. Also referred to as confetti. Frit: Glass that has been broken or ground into smaller pieces. It usually comes in different sizes, coarse, medium, fine, or powder. Dichroic: Dichroic means two colors. When this glass is viewed from different angles, it appears as numerous colors. The word “dichroic” is pronounced Dye-Cro-Ick. The name comes from two Greek roots, “di” for two and “chroma” for color. Stringers: Smaller thin round rods of glass that are approximately 1.5 mm thick. They look a lot like spaghetti. They can also be broken into smaller pieces and used for decoration or accents in fusing. COE-Coefficient of Expansion: Glass expands and contracts at various rates. These rates could have an effect on your artwork if using two dissimilar kinds of glass, each one melting at different temperatures and then each contracting at various rates. Therefore it is important that your glass be compatible. This rate of expansion is referred to as the Coefficient of Expansion which is abbreviated and called the COE of the glass. Remember, all glass is not created equal and when heated and cooled the COE has to match or it will crack upon cooling. We are using a COE of 90. NEVER run your fingers along the edges of the glass, this will cut you. Always be alert and aware of glass edges. Wear thin gloves if possible. Wear goggles/eye protection when cutting, grinding or sawing glass. Wear mask when sanding or grinding glass-it is hazardous to breath the glass particles. Do NOT Wipe your work area clean with your hands, small pieces of glass will cut you! Use a damp paper towel to wipe down your area & throw it away when finished. ALWAYS Wash your hands after working with glass. TEACHER cuts glass ahead of class period. Cut many bases in various shapes if desired. Place frit, shards, stringers, and dichroic pieces into separate containers. 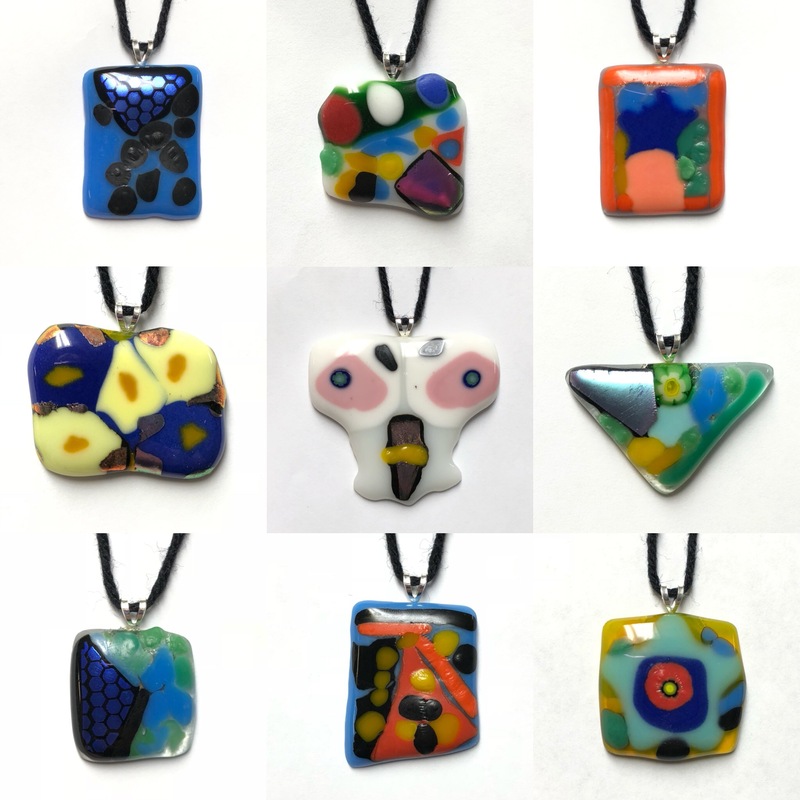 Project Objective: Create an original designed fused glass pendant. 1. Get a plastic tray to work on. 2. Choose a BASE color/shape. 3. Choose any frit, stick or shard colors (not too many-you can always go back for more). 4. Choose 1 dicroic glass piece and 1 glass flower (if desired). 5. Arrange your pieces together until you are happy with the design. Try to have one focal point. 6. Use clear glue and the toothpick to glue your piece together. Only use SMALL amounts of glue. These are what they look like prior to firing. 7. In your sketchbook, draw your design. Write about the elements of art you used in your design. 9. Use a grinder to smooth out any pokey edges. Wear safety glasses for eye protection! 10. Glue a jewelry bail onto the back of the fused glass pendants using e600 glue. *Amazon Affiliate Links- I only link products I use and love! If you choose to use ANY part of this blog (graphic, pictures or written text), please link back to Create Art with ME! Artists that Inspire Beyond Challenges!